Gundamma Katha is a classic film from 1962 and is considered to be one of the last great films to be produced by B. Nagi Reddy and Chakrapani under the Vijaya Studios banner, which also gave us Mayabazar. It features an all-star cast, lovely production design and a lyrical score by Ghantasala. Sadly the Shalimar DVD has really ordinary subtitles which detract from what is supposedly a well written story. Perhaps they meant thirsty? Who knows. The story revolves around Gundamma, a wealthy widow who has one spoilt and indulged daughter, one Cinderella like step-daughter from her husband’s first marriage and one largely absent son. Gundamma rules the household with an iron fist and her reputation as a termagant is well known in the village. She wants to make an advantageous match for her daughter Saroja but her wastrel brother Gantayya throws a spanner into the works every time. As Gundamma casts her matrimonial nets wider she contacts wealthy Ram Bhadrayya, a friend of her deceased husband, who has two eligible sons. While Ram Bhadrayya wants to help his former friend’s family, he is concerned about the values and character of the girls and decides to put them to the test. NTR plays Anjaneya or Anji and it is decided that Laxmi (Savitri) is the best match for him. Since Laxmi is effectively a servant in the household, he poses as a labourer in order to get closer to her, and to appear to Gundamma as an appropriate suitor. This part of the deception seems very typically filmi and almost justified, since Laxmi does deserve better than the life she has. NTR is charismatic as the exuberant Anji, and Savitri is beautiful as Laxmi. Their relationship develops over conversations and teasing, and they develop a true appreciation for each other. With a jaunty song Anji points out to Laxmi that women can do whatever they want to do in the world, and she should have no fear in letting herself be more than an unpaid servant to her step-mother. Sadly this enlightened attitude turns out to be lip service as the story progresses, but the partnership of Laxmi and Anji does seem to be a happy and balanced one. Ram Bhadrayya’s second son Raja (ANR) woos the privileged and spoiled Saroja (Jamuna) and finally marries her. Playing out a drama concocted by his father and Anji, Raja tells Saroja that everything was a lie and that he is not even Ram Bhadrayya’s son. After some more drama Saroja is forced to choose between her home and comforts or leaving to an unknown future with her drunk and possibly criminal husband. This deception is all to ensure that Saroja has a proper wifely attitude and will look after her husband in the manner he feels appropriate. Saroja doesn’t seem to deserve all of the heartache she is put through, as her attitude already appears quite appropriate for the wife of a wealthy man. It doesn’t seem likely that she will have to clean pots and pans, plough fields and cook once she is established in her new household but she is forced to learn as she lives in near poverty with her husband. Why her father-in-law feels this trickery is necessary for her to become a better wife is not apparent to us. She actually seemed to be mellowing and becoming more empathetic as her romance blossomed with Raja. It certainly wasn’t a palatable part of the plot and made the second half of the film much less enjoyable. 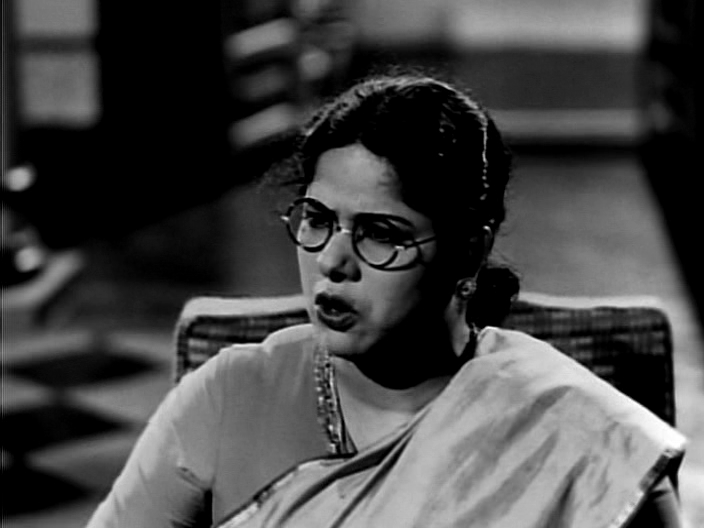 Throughout all of the drama, ANR manages to instil the character of Raja with enough charisma that Saroja’s devotion to him is understandable to some degree, although her behaviour is clearly driven as much by wifely duty and the expectations of society as anything else. Jamuna is excellent in her early scenes as the lazy daughter and also as the bewildered wife whose world rapidly falls apart. Despite this couple’s rather dubious story there are some lovely duets which are beautifully depicted and in these scenes the two actors have great rapport with each other. The growing closeness is illustrated by the proximity of their sleeping mats – initially on opposite sides of the room, by the time ANR decides to reveal the truth they are happily snuggled up next to each other. The cinematographer Marcus Bartley has a reputation for creating beautiful moonlit lighting effects, shown to great effect here and in Mayabazar. The costumes are lovely, and very much serve to illustrate the status of each character. A simple change in clothing is all it takes to make a prince a pauper and back again. Initially Laxmi wears cotton saris and simple blouses while Saroja gleams in silk and jewels. As the sisters’ fortunes change, so do their wardrobes. The film excels in the story of Gundamma, played by Suryakantham (who apparently made her career out of playing wicked stepmother type characters). 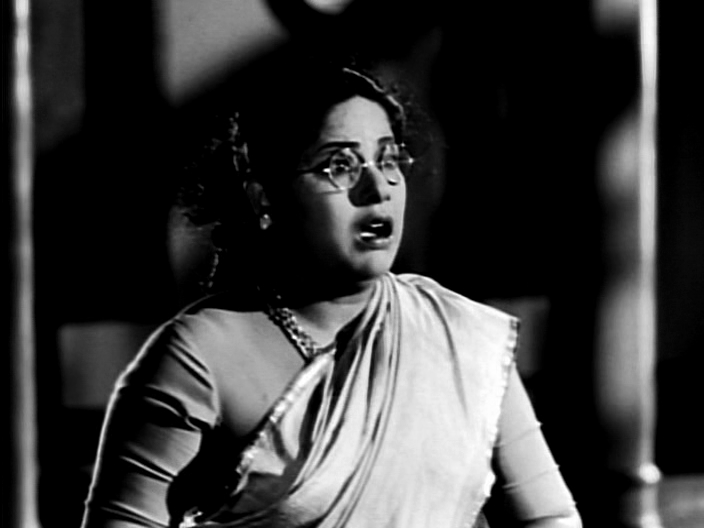 Gundamma’s scenes with the argumentative and shifty Durgamma (Chayadevi) are well written and enough to make anyone duck for cover when the two start fighting. Her clashes with the various members of her family are realistic and energetic. Her final humiliation, which eventually results in her reconciliation with Laxmi, is a nice twist to the story and a suitably sentimental resolution to the melodrama. The lead actors were all at their peak when Gundamma Katha was made and they seem to share an easy rapport. In particular the many wordless exchanges between the two brothers are great to watch as they convey so much through their posture and gestures alone. Savithri and Jamuna are beautiful and show distinct personalities without ever falling into caricature. The sisters’ relationship is not as friendly as the boys’, but they exhibit familial love and loyalty regardless of their difference in status. Once again, the comedy track is hit and miss and we have different opinions as to what succeeded. The film does end in a rushed few scenes of everyone reconciling. We were disappointed by this as it seemed a bit under-written and hasty, and also because there was never any sense of owing the ladies any explanation for what had been done to them. Granted, Gundamma, Laxmi and Saroja were none the worse off in a material sense at the end of the story, but they had been lied to and manipulated and that was hard to swallow. Certainly we expected more anger or argument between the couples. Setting up three strong and intelligent women and having them turn into doormats by the end of the film was a major let down. We haven’t really mentioned the lovely L Vijayalakshmi who played the boys’ cousin Padma. She was actually the sensible and sane one who married the man she wanted (Gundamma’s son) and stood up for what she wanted. Apart from looking lovely and putting Gundamma back in her box, she also performed a very pretty classical dance which was a highlight in this largely non-dancing film. The music is very melodic and the songs seem to suit the characters and the situation. We were amused to recognise the opening titles music, also used in that L Vijayalakshmi dance, as the riff from recent Hindi hit Pe Pe Pepein from Chance Pe Dance! Temple says: I liked a lot about this film – the cast, the production design, the music and the cinematography. I strongly disliked the story. The message seems to be ‘be strong, intelligent, independent…until your husband tells you to stop’. In addition to my issues with that, the character of Saroja just wasn’t written as someone eligible for Taming of the Shrew type behaviour modification and so the treatment meted out to her seems harsh, unnecessary and not in keeping with her actions in the film. The acting style has really dated, especially that of the male cast members. ANR and NTR do have oodles of charisma, which makes the stomping and scenery chewing much more entertaining than it might have been. But the acting honours go to all the ladies – which is ironic in a film that certainly isn’t about girl power – with Savitri the stand-out performer. She is beautifully expressive without ever being over the top. The minor supporting cast didn’t make much of a contribution other than to add the alleged comedy (regular readers will know I suffer from Comic Sideplot Intolerance). It seemed a waste to have Allu Ramalingaiah as the hotel owner as he had so little to do. I really found Ramana Reddy as Gantayya (Gundamma’s dodgy brother) annoying and hammy and I fast-forwarded through many of his scenes just so I could get through the film. Actually, I think the fast forward button was essential to me getting through this – I was bored by the over-acting and repelled by the story so this wasn’t the pleasure to watch I had hoped for. Time hasn’t been kind to this classic. I give it 3 and 1/2 stars, just for the stars. Heather says: This is a film which both looks and sounds very beautiful and from this point of view is an absolute winner. The story of Gundamma and her two daughters had a lot of potential, and it’s a shame that the writer D.V.Narasa Raju decided to turn the two sisters such perfect and therefore perfectly dull wives by the end. Both Laxmi and Saroja had plenty of personality at the start of the film and eradicating this in the quest to make them the ideal wives just made them rather less interesting to watch. The lack of a reaction from Saroja when she discovers the deception was particularly irritating considering she had just been put through absolute misery by the man proclaiming to love her. It was also a little odd that the start of the film featured a song all about women’s rights and then proceeded to firmly walk all over them. I suppose that in 1962 it was more important to adhere to conventional principles rather than allow a strong-minded woman to succeed. However, despite these issues with the storyline, I did enjoy the romance between Anji and Laxmi. Their songs, as well as the duets between Saroja and Raja, were really lovely. 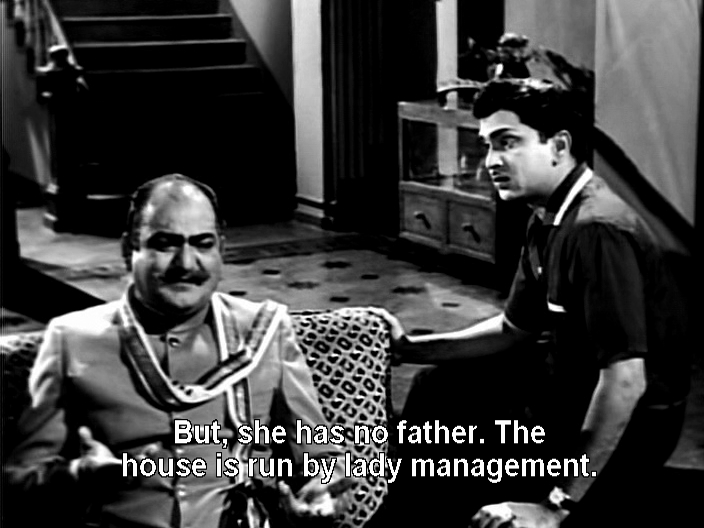 The characters of Gundamma, her perpetually scheming and whining brother and the very shady Durgamma were much more entertaining. The interactions between them all were much more believable and seemed to be better written, although this could just be due to the subtitles. I found the comedy scenes with Ramana Reddy and Allu Ramalingaiah in the restaurant to be really funny, as were his scenes with NTR. What can I say? I’m Irish and it reminded me so much of similar scenes I’ve seen at home! The comedy track here worked well for me, and was much more enjoyable than the unsettling story of Saroja and Raja. ANR and NTR were excellent together and their relationship as brothers was very well portrayed. I also liked the minor characters and the way their individual stories were worked into the plot. 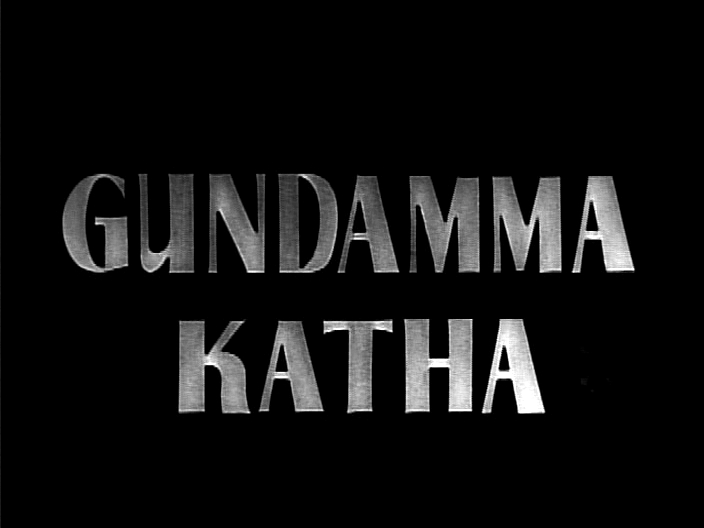 The standout performance though was that of Gundamma, and for that alone this film deserves to be a classic. Without the Raja and Saroja storyline it would have been even better, but overall I enjoyed this film and it gets 3 ½ stars from me. This entry was posted in Tollywood and tagged Allu Ramalingaiah, ANR, Classics, Ghantasala, Gundamma Katha, L Vijayalakshmi, NTR, Ramana Reddy, S.V. 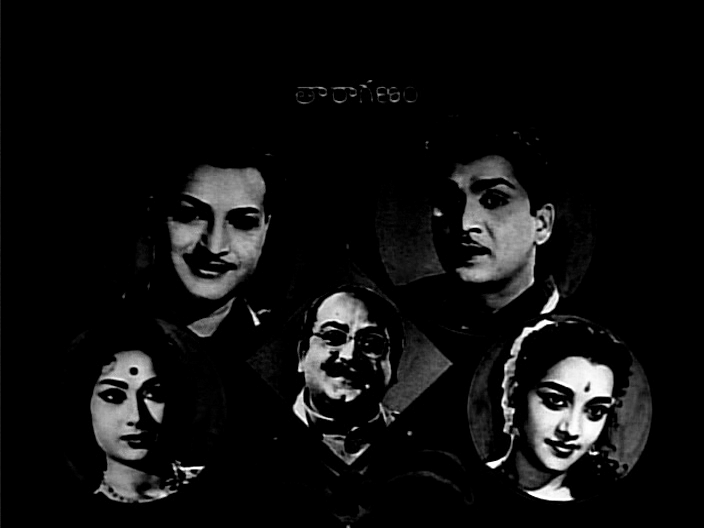 Ranga Rao, Savitri, Suryakantham, Telugu, Tollywood. Bookmark the permalink. Hmm. Pity such visual beauty and some strong acting are wasted on an enraging story! I am not sure I would have made it all the way through given the contrast of awesome female acting with a story that beats them down so. The song by Vijayalakshmi is fab! You know I will take that first image for Paagal Subtitle. And talk about a waste – there is so much of thrusty feeling in later fillums! Well, I suppose it’s good that work can still distract you from the Shash. Egregious typos and punctuation errors (mine) are another reason not to read and comment on blogs during work hours. Hee, isn’t it hugely unusual (and highly ironic) that the Hindi remake would be more “revenge-driven” than the Telugu original? I think most of the flaws about how the story treats the female characters apply to Swayamvar as well, but still I’ll probably see this for the pretty black-and-white cinematography. 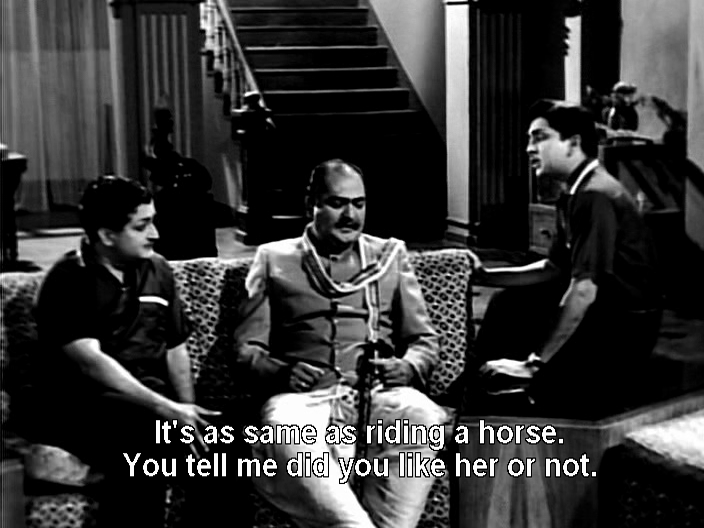 It’ll be a good excuse to rewatch Swayamvar and compare it to this one. I’ve only seen NTR in mythologicals; I’m looking forward to see him as a regular human being! *As I read on with the review, I was thinking “oh, I’m sure someone has already noted this in the comments, but to make it to the bottom, and even Beth hadn’t commented on the Shashi connection! I feel oddly elated to have caught that piece of trivia! I thought Saroja’s treatment after marriage is appalling. She certainly didn’t deserve that for her mother’s reputation. Trying to be fair: There is a reputation for Gundamma that she poisoned her husband for the wealth. (propagated by Gantayya). This is repeated by the father to his two sons while explaining the proposal. So, I guess they had to ensure that Saroja is wiling to go through anything for the love of her husband, even if he is poor. But, I still don’t like what ANR did. That’s too harsh. Ha-ha..re: cooking. If she is a gold-digger, he has to be rich for her to poison him. I primarily like this movie for Savithri. NTR and others would assume her to be a pushover but she is really strong and that shows right after her marriage during the song in their car ride. I always hated the ANR/Jamuna’s part. Personally, I didn’t like that he tricked her by stealing her purse even before marriage. And that portrays him as more sneaky and immoral than anything Saroja every did. Saroja is pegged as a spoilt brat just because she has been pampered by her mom and without any evidence (other than being a late-riser) that she really is bad. By the same token, Padma should’ve been considered ‘spoilt’ too.